MORRISTOWN, NJ (August 1, 2017) – Villa Italian Kitchen, one of America’s favorite quick-service pizza brands, today announced the launch of The Mooch – the most front-stabbingly delicious spaghetti, meatball and Caesar salad combination meal available on the market. 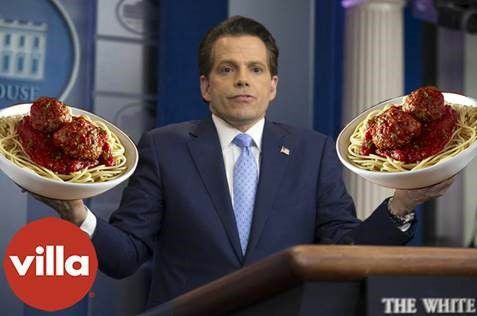 The Mooch will be available to all guests, including leakers and paranoiacs, at all of Villa Italian Kitchen’s more than 200 locations nationwide for 11 days only, beginning on Wednesday, August 2. A delicious Italian classic, The Mooch is masterfully prepared using imported spaghetti from Italy prepared al dente, two mouthwatering meatballs in house-made marinara sauce, a side Caesar salad made from crisp romaine lettuce, creamy Caesar dressing, croutons and parmesan cheese and a freshly baked garlic roll. The Mooch has a suggested retail price of $8.19 (cost may vary per location).